Correlation analysis measures the relationship between two items, for example, a security’s price and an indicator. The resulting value (called the “correlation coefficient”) shows if changes in one item (i.e. an indicator) will result in changes in the other item (i.e. the security’s price). When comparing the correlation between two items, one item is called the “dependent” item and the other the “independent” item. The goal is to see if a change in the independent item (which is usually an indicator) will result in a change in the dependent item (usually a security’s price). This information helps you understand an indicator’s predictive abilities. The correlation coefficient can range between 1.0 (plus or minus one). A coefficient of +1.0, a “perfect positive correlation,” means that changes in the independent item will result in an identical change in the dependent item (e.g., a change in the indicator will result in an identical change in the security’s price). A coefficient of -1.0, a “perfect negative correlation,” means that changes in the independent item will result in an identical change in the dependent item, but the change will be in the opposite direction. A coefficient of zero means there is no relationship between the two items and that a change in the independent item will have no effect in the dependent item. A low correlation coefficient (e.g., less than 0.10) suggests that the relationship between two items is weak or non-existent. A high correlation coefficient (i.e., closer to plus or minus one) indicates that the dependent variable (e.g., the security’s price) will usually change when the independent variable (e.g., an indicator) changes. The direction of the dependent variable’s change depends on the sign of the coefficient. If the coefficient is a positive number, then the dependent variable will move in the same direction as the independent variable; if the coefficient is negative, then the dependent variable will move in the opposite direction of the independent variable. When comparing the correlation between an indicator and a security’s price, a high positive coefficient (e.g., move then +0.70) tells you that a change in the indicator will usually predict a change in the security’s price. A high negative correlation (e.g., less than -0.70) tells you that when the indicator changes, the security’s price will usually move in the opposite direction. Remember, a low (e.g., close to zero) coefficient indicates that the relationship between the security’s price and the indicator is not significant. 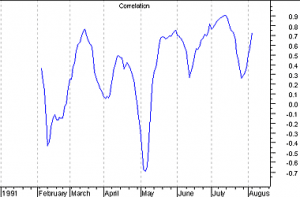 Correlation analysis is also valuable in gauging the relationship between two securities. Often, one security’s price “leads” or predicts the price of another security. For example, the correlation coefficient of gold versus the dollar shows a strong negative relationship. This means that an increase in the dollar usually predicts a decrease in the price of gold.